This is a picture of a Sumatran tiger cub who lives at the National Zoo in Washington DC. We live not to far from there. 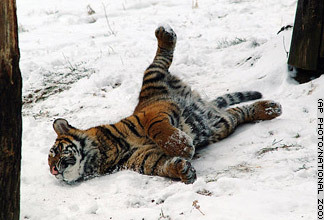 I like to roll on my back like that, but I have never tried it in the snow. I found this while perusing CNN's Offbeat Images. I have had such a busy week. Vicki has been sewing and for once she is using a fabric I can get interested in. I helped her lay out the pattern and make measurements. The fabric was quite bulky and it kept sliding off the table. I willingly gave of my time to act as a paper weight, well, fabric weight. I was such a very good helper, that when Vicki had cut out all the pieces she needed and discovered she had extra fabric, she decided to reward my diligence by making me a blanket of my very own... Here I am helping her figure out what size it should be. Well, it was almost my very own. At the last minute Riker showed up. Vicki decided it needed to big enough for several of us to use at once. Guests to the Ashton house often complain that my daughter and I are hard to tell apart. I think that this picture may help to point out how different we actually are. Please note that Riker is on the left and I, Socks, am on the right. 1. Yes, we are similarly colored, but as you can see Riker's markings swirl, and mine are spots that form stripes. 2. We both have white on our necks, but Riker's stops at her chin. Mine extends up around one cheek and up my nose bridge. 3. Not obvious in this picture is the fact that Riker is quite tall and slim. I am much more normally cat shaped.